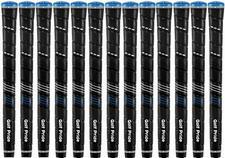 Golf Pride CP2 Wrap Standard Golf Grips (Set of 13 Golf Grips) - $79.99 - GolfersEdgeOnline.com - Best Golf Equipment On The Web! Combining high-performance technology with a soft, tacky feel, the innovative new CP2 Wrap delivers comfort and control for superior performance. Featuring Golf Pride’s exclusive Control Core technology, a 2.5” inner core stabilizer is specifically engineered to reduce torque. A reduced taper design allows for even grip pressure in each hand, and a soft, high-traction surface provides comfort in every swing. With the CP2, control fits in the palm of your hand. If you have any more questions about the Golf Pride CP2 Wrap Standard Golf Grips (Set of 13 Golf Grips); do not see the model you are looking for; need custom options; or prefer to not purchase online, then please call us at (630) 656-1291.